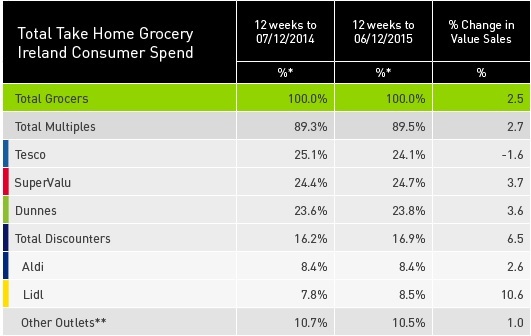 Supervalu remains Ireland’s number one grocery retailer as Christmas approaches, figures from Kantar Worldpanel show. The latest supermarket share figures from Kantar Worldpanel in Ireland were published for the 12 weeks ending December 6. 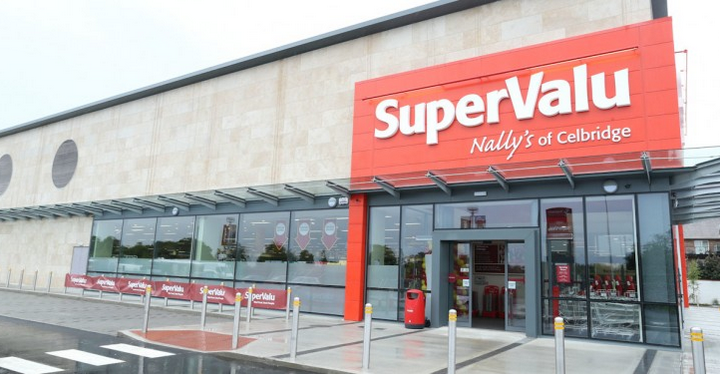 David Berry, director at Kantar Worldpanel, said that it hasn’t all been plain sailing for Supervalu – over the past six months the retailer has seen falling shopper numbers, but in the past 12 weeks it has managed to get that issue under control. “This has allowed Supervalu to strengthen its position at the top, posting impressive sales growth of 3.7% and increasing its share of the grocery market to 24.7%. “Alongside a strong performance in its traditional heartland – fruit and vegetables – the grocer also posted excellent sales in confectionery, crisps and snacks and soft drinks during the past quarter. “Tesco remains in second place with a 24.1% share of grocery sales. While value sales may have dipped, we have seen growth in the number of items shoppers are picking up on each trip. “The reduction in value sales is linked to the fact that these items are at a lower price point than last year, leading to a dip in the retailer’s value share of the grocery market,” Berry said. Dunnes Stores’ sales continue to grow, Kantar figures show, with an increase of 3.6% this period to cap off a strong year – the retailer has seen non-stop sales growth for the whole of 2015. Dunnes has continually managed to encourage shoppers to spend more per trip, with its Shop and Save campaign helping to create a more loyal customer base and increase its market share to 23.8%, according to Kantar. Elsewhere, Lidl continues to post the strongest growth with sales increasing by 10.6% as 37,000 more shoppers visited the retailer compared with the same time last year. According to Kantar, Dublin has proved a particularly strong region for Lidl, with shopper numbers in the nation’s capital increasing by 10% this quarter. Aldi’s performance remains ahead of the overall market, with sales growth of 2.6% and market share holding at 8.4%, it found. While the big Christmas shop has yet to take place there are signs that shoppers may have begun their preparations for the festive season earlier this year. “Confectionery, crisps and snacks have all seen double digit growth in shopper spend when compared with last year, helping to increase overall grocery sales by 2.5%. “Such strong growth is an early indicator that Ireland’s retailers could be in for a bumper Christmas, and we’re sure to see grocers competing eagerly for the biggest slice of festive sales,” Berry said.